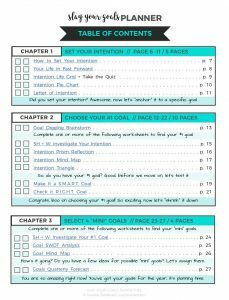 This Goal Setting planner is one of the most in depth I’ve seen, with so many methods and activities that I hadn’t heard of before. There is a table of content that is interactive so you can click on the subjects and be taken straight to that page. 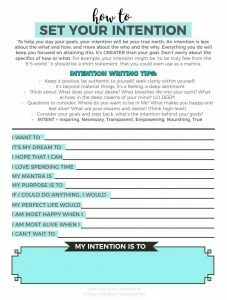 The planner starts with setting intention, with 5 pages of activities to help you with setting your intentions. If those pages aren’t enough there is also a quiz for you to do too. You then have 10 pages focused on choosing your goals. It starts with a brainstorming session about what you would like to achieve and what you want from life. You then move on to turning your intention into a goal using the “5W + H” method. This stands for who, what, when, why, where and how. The next few pages take you through making your intention a specific goal after thinking about what you’ll need to do to make your intention a reality. Everyone these days has heard of SMART goals and if you haven’t yet this will be really useful for you. Every goal I set now is using the method of SMART goals and since doing so I have achieved more than I did when setting standard goals. The next method is one I haven’t heard of but is a great addition to setting a SMART goal. It is called R.I.G.H.T, which means resolves, intuitive, genuine, hopeful and transforms. This section asks you questions about whether this goal is right for you for you to dig deep and be sure the goal is what you want and need in your life. The next section is setting some mini goals, again using the 5W + H method. There is then a SWOT analysis – strengths, weakness, opportunities, threats. The aim of this section is to create 4 mini goals to contribute to the main end goal that you have set. You then focus on each mini goal for a quarter of the year to achieve your end goal by the end of the year. This is a 16 page section, there are a few different templates to choose from for your yearly planner. This is followed by a strategic planning road map which I really love. 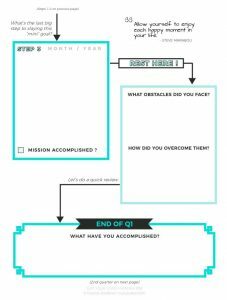 It is 2 pages for each quarter and takes you through the 3 months in each quarter to plan your actions. There is then a review section at the end of each quarter. In the next section there are flow charts to support you in achieving your goals. 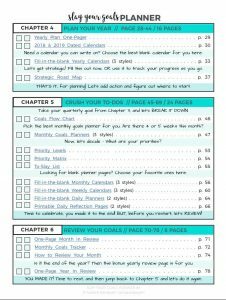 The section is full of methods and activities including a goals flow chart, four different styles of monthly goal planners. It then moves onto prioritising your action steps and levering how important they are. There is then space to make a to-do list followed by some more monthly planner templates. The last few pages of the section include weekly planners and space to write action steps for the week focused on your mini goal. The last section of the planner is of course the review section. The first page is a review of your goal in the previous month – what you learned, achieved and discovered as well as what your grateful for, what progress you made and any affirmations or quotes you used for the month. There is then an in depth review of the month with 11 questions for you to answer. The last page is a review on your whole year and big end goal which I’m sure if you followed this booklet you would be very likely to have achieved. This booklet is in so much detail and contains so much to support you in achieving your goals. I also like that there is a few templates to choose from for the planners because people have different ways they like to do this so there is something for everyone. I have no doubt that you will enjoy this planner as much as I do. Click here for more information and to watch a video about the planner. If you’d like to join the Facebook Community for more support on your personal development journey I’d love to have you over there. I set goals all the time, but I think I could be so much more effective if I had this planner! It sounds like a great way to keep organized and focused! This is SO useful. Thank you so much! Please do more of this! Wow! This looks very useful! Wow, what an awesome planner! I love the idea of setting the RIGHT goals. It would help me to set goals that are attainable. I also love to review previous goals to see what I’ve accomplished. It definitely seems effective and provides structure! 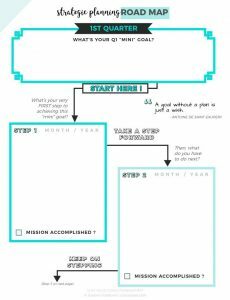 What a great planner, I love how it sets up mini goals which are so important not just to help you accomplish your bigger goals but those mini goals really give you a great sense of accomplishment! I love setting goals. This looks like a great way to stay organized! I love how thorough this is! I need to be setting goals more regularly in the other areas of my life like I do with my business. Thank you for this! 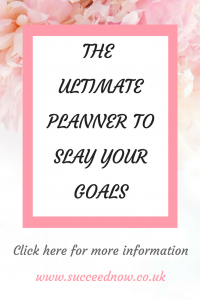 Hey Lucy, I so love your review of the Slay Your Goals Planner! So glad you’re enjoying it and finding it useful for achieving your goals. Wow! I really love how in depth this is. And I’m obsessed with planners and this has to be one of the best ones I’ve seen! I love writing in journals and planners, it really helps me stay on track. These look like great planner sheets. Wow! This looks like it would really help keep you focused! I love how it really nudges you to clarify what your goals are.